I’ve not met a chef more outspokenly confident, friendly and candid! In between cooking, Chef William Kwok would periodically pop into the dining room, meet and greet his diners, chill with a drink, share a story or two (or three), all in cool James Bond composure! Those chaotic kitchen scenes we see in movies don’t seem to exist here in Kwok’s territory! Hailing from Hong Kong and with many good years of culinary experience under his belt, Kwok joined the private dining concept at The Magic Wok not too long ago and his magical wokmanship has been stirring up some palates ever since! His signature dishes aren’t listed on the menu. Call in advance to “book” his specialties or just turn up, sit back and let the the chef decide! We kicked off the evening with a peppery Pig Stomach Soup. I grew up on this when my own mother had the time and energy to clean and wash this reeking pig’s gut. Its a long, tedious task. Kwok makes this old Cantonese classic with pickled vegetables, chicken feet, bones, herbs and white peppercorns. The cleansed pig stomach was spongy and tender thanks to timely simmering. The pickled vegetables induced a refreshing zing to the soup while cutting the spiciness of the peppercorns which are used to slay any lingering stink. The clean sweet-savory peppery soup warmed and soothed our tummies. There’s no sign whatsoever betraying the original character of pig stomach. I’m reminded of my childhood and how much I enjoyed this soup. What a great start to dinner! Salt & Pepper Squid seemed almost plain and dry until you bite into it and there’s nothing plain nor dry about it! Instead, the plump mollusc, quick fried with salt & pepper and topped with crispy garlic crumbs was intensely flavorful, totally juicy and tender! The Cold Cucumber Salad is seasoned heavily in a wasabi soy dressing. The chilled crunchy cucumber strips are combined with tender shimeiji mushrooms, earthy wood ear fungus, nutty sesame seeds and bits of fiery bird’s eye chili pepper. A multitude of textures, a lil salty, a lil spicy; very refreshing and satisfying! Steamed Grouper Hong Kong Style- In Asian cooking, when the fish is fresh (read~ alive and swimming! ), there’s no better method than steaming the fella. Done in mere minutes and over high heat (and no peeking in between! 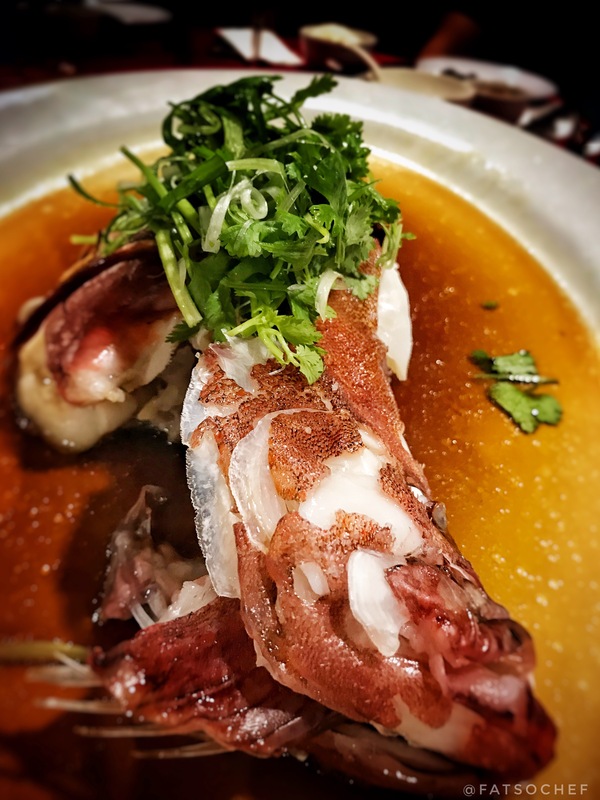 ), the grouper will yield meat that’s firm to the touch and soft to the bite. Kwok spoons his superior soy sauce dressing over the fish before swiftly cutting it up for us. “And this is how you eat fish!” he quips! Having heard we had Bamboo Clams the day before, Kwok insisted we tried his “out-of-this-world” version. He steams them with garlic and black beans, with the latter lifting the natural sweetness of the clams. Albeit not “out-of-this-world”, they were super fresh, sweet and importantly, not a second overcooked. Ginger Chicken is technically poached kampong* chicken buried under a mountain of chopped ginger. The pairing of chicken with ginger is orthodox. But this much ginger is bringing it to the next level!! Personally I love this match up, chicken and ginger… but for me this needed an aftertaste… a bit more savoriness, be it on the chicken or the ginger, but it was missing on both. Fried Intestines- these crispy innards were a hit. Freshly deep fried, yet grease-less; crispy on the outside and juicy on the inside! With no foul smell, taste, whatsoever that’s common in this disgusting organ!!! Mind you, I say that with love and adoration! No need for more words…Wiped out in seconds 😋😋! 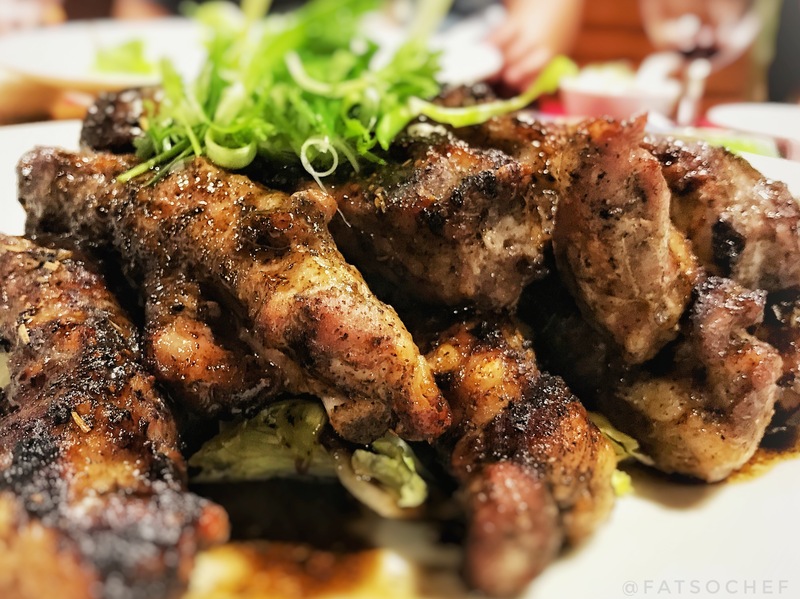 Claiming the crown for many of us… Kwok’s Black Pepper Iberico Pork Ribs were AMAZING! The long ribs were generously coated with spices and a robust black pepper rub, then grilled to perfection. The toothsome fleshy ribs were moist and lusciously tender! The flavor sinks right to the bone. We were appreciative of rib’s huge size as we couldn’t stop gnawing and licking the sauce off gloved fingers!! With deadpan eyes, Kwok asked, “Never tasted anything so good, eh?” To end, the self proclaimed Master Chef whipped up one of the most basic dishes in Cantonese cooking, Stir Fried Horfun*. Like a true Shifu*, Kwok relentlessly tossed and flipped the noodles in extreme heat, creating a smokiness in the otherwise bland rice noodles. Then he goes on to make a fermented bean brown sauce, reducing that into a smooth rich gravy. Added to that, perfectly cooked tender Iberico pork collar meat, crunchy tri-colored capsicums and sweet onions. The thick beautiful gravy is then poured over the noodles… it sinks gradually, into every creek and crevice and to the bottom of the plate. A raw egg cracked on top adds the finishing touch. ​ Kwok proceeded to mix the noodles before serving. We watch as the steaming gravy envelops every strand of noodle. The flavor was outstanding. The texture was smooth and luxurious. The meat, tender like butter. The wok hei* was wicked! This was my top 👑 dish for the night! 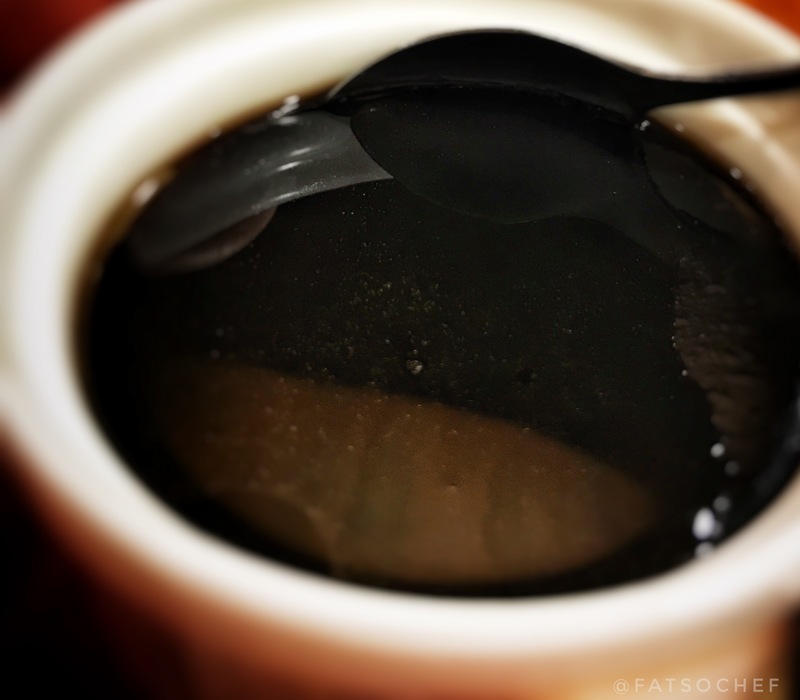 For sweet endings, Chef Kwok highly recommended his homemade Guilingao, a black jelly-like dessert made from the powdered shell of the turtle. I am a big fan of this bitter sweet dessert and swear only by the famous Kung Wo Tong in Hong Kong… (and still do 😝). 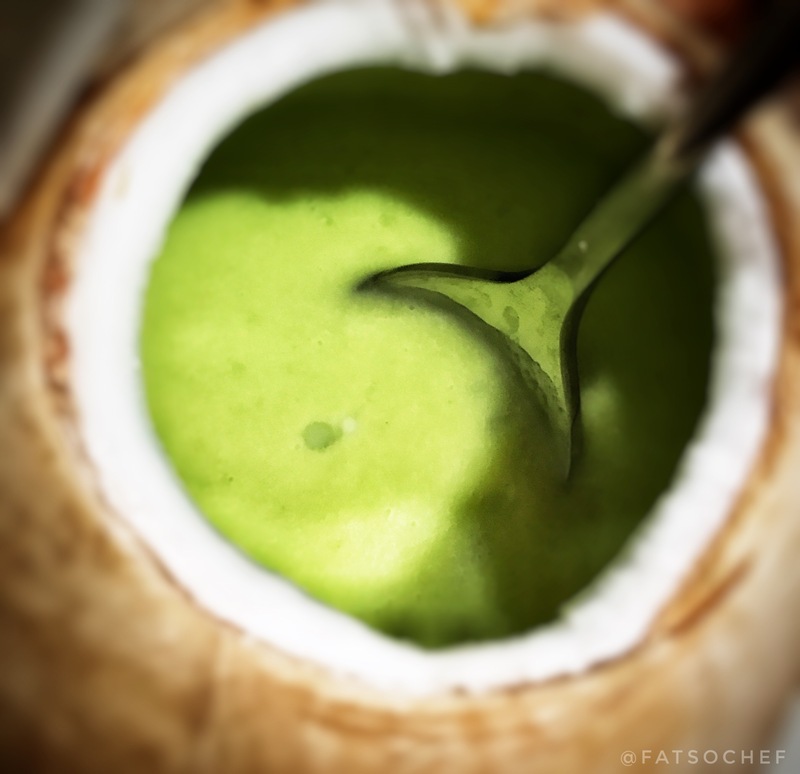 The chilled Avocado Cream in Coconut had so much potential. It was light and refreshing! I love both avocado and coconut and this could have been perfect if I had been able to scrape off some fresh coconut flesh from the fruit. Clockwise from top left: Plump and crispy fried large instestines; glistening Hor Fun; Gnawing the rib clean and shiny! ; Those Iberico Ribs that wowed! Clockwise from top left: Avocado Cream in Coconut; Chicken & Ginger; The Master Chef in action; Ingredients from the Pig Stomach soup. Kwok had displayed skills of a fine Master Chef beyond question. And despite some misses which could construe to personal taste, I am certain he is a genius behind the wok. I am all geared for a sequel at The Magic Wok! And for a man as cocksure as Kwok, you know he will push his limits to impress… and I can’t help but know, impress, he shall! Thanks to my fellow KL foodies, Sekron, for showing us The Magic Wok! *wok hei ~ refers to the flavour and tastes imparted by extreme heat from a hot wok onto food during cooking. Previous [Travelogue] Kuala Lumpur- Gettin’ Fresh with Keong Kee! Next EAT FIRST 食之为鮮 … No Frills but No Less!